This entry was posted in Chaosium's Basic Roleplaying System, Nostalgia by Newt. Bookmark the permalink. That rang faint bells… so I went hunting on the RPG shelves. Lurking at the back is a book called “Elric”, by Chaosium. The rule system looks a lot like RQ, could well be BRP, and a lot of the rest fits, on a quick glance. It’s just about mint. I’m never going to use it – want it? Thank you for your kind offer but I’ve already got a copy (lurking in the attic). Stormbringer was a brilliant game. Not so faithful to the books, but awesome in play. Balance? That will be the Cosmic Balance, as life is cruel, and there is no other balance to be seen. And yes, mine fell apart too and lived in a lever arch for 20 years. I am now working on removing the punch hole protector rings and see if I can have it properly bound again. I liked Elric!.. different vibe but more consistent with where the canon had gone by then, since MM had written a new tranche of later novels. I’d say the GW edition is basically a variant 2nd edition.. not a 3rd edition at all. Totally imbalanced and crazy, with a massive T&T style influence from Ken St. Andre, the original Trollmaster himself. I was unusual in purchasing and running ‘Hawkmoon’ instead of ‘Stormbringer’ in the 1980s. 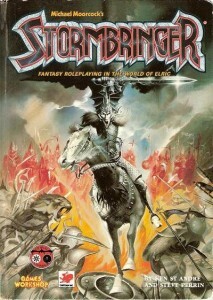 I played Stormbringer back int the day and was the gamemaster. I found the system highly unbalanced but when you focused on the role playing element rather than the mechanics, it was really fun. Additionally, I was a GM that tweaked the rules a good bit and managed the game toward an enjoyable romp through the Young Kingdoms. 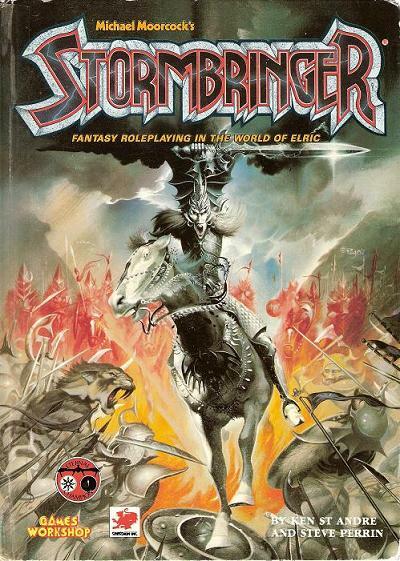 I think the players I GM’d for had the most fun when we played Stormbringer because they knew the implications of Law and Chaos and the power that certain sorcerers would bring. A copy of Stormbringer, in one form or another, has been in my backpocket since I borrowed and Never returned a high school friends copy back in 1984. At one point in my late teens-early twenties I was bouncing around the country with nothing but my rucksack, a copy of “On the Road” and my other book was said softcover Stormbringer 1st edition rule book. Whether stuck in the middle of nowhere or in a city bus station I could disappear into a world of fantasy with either one of these books. In San Diego one night I got these guys who never heard of rpg’s to play and all I remember was one of the shipwrecked rogues throwing his hand axe at charging natives and splitting the natives skull open with a critical hit. I was using 2d6 from a Monopoly game and roughed out percentile chances with them. I’ve owned this Games Workshop edition as well. It was the copy I had during my college years. It disintegrated and is lost with the comic book collection I had accumulated at the time as well. The last twenty years Elric! softcover has sat proudly on my bookshelf and it still serves as my gateway to languid daydream escapism as I dream up gritty Sword & Sorcery adventures.